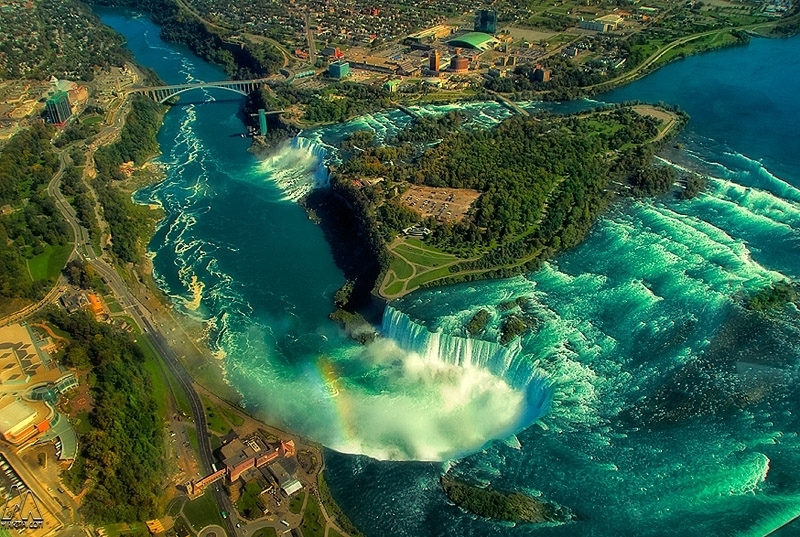 Aerial view of Niagara Falls. It was really impressive to fly over Niagara Falls (helicopter). I can only recommend it. It's a whole new way to see the falls. Impresionante caida de agua, la vista es increible! The colors are outstanding, looks almost unreal. How did you get so high? Stunning scenery. I like the small glimpse of the rainbow. Marta! Fantastic view! Wonderful colors and perfect processing. BRAVO!!! Nice view and processing. It has some dreamy touch, I like it. No és el primer paisatge "a ojo de pájaro" que publiques, no? És molt espectacular, els blaus preciosos. Salutacions! Wow! That's a powerful image. The colors are glorious and the perspective is so unusual. How did you get this view? This is incredible! Although the scene and shaprness are perfect, the colors are amazing and unexpected. Great! Superb image! Such a wonderful perspective and colors! Qines vistes, a vista de "pajaru" de veritat!! impressionant , amb la visita en barca jo ja vaig venir al·lucinada. des de els aires ja deu ser tot un espectacle. Wunderbarer Blick auf den Horseshoe ... ich habe immer noch den Lärm der Fälle in den Ohren. I've gone to Niagara many times but never seen it from high up! Fantastic photo! Lucky you! I must try one day :) Amazing view, beautiful captured! Wow, stunning scenery ... superb colors and contrast in this image ... well done! really stunning, I guess I would have to do this too now that I´ve seen how it looks like! Espectacular Marta, como siempre, grnaciosa fotografia, un saludo. Great capture. Like the water color. Hope you had fun! I like your style, again ^^. espeacialy the colors are superb. good postprocessing :D.
Buenooo! Que xula i quina enveja :-) ! Wow, fantastic aerial shot!! Stunning view! Wow, wonderful!! Stunning view and superb colour!! This is one of the most beautiful photos I have ever seen. It almost looks as a painting, or better yet, a concept art poster! Before reading what you wrote..I wondered how you were to have captured this perspective of the falls. Am not sure what else to say other than - WOW! WOW! WOW! Spectacular!!!! There is a river named "Green River" but its not this one. It has the feel of a large scale miniature and the way it looks with the light and texture, gives a painting-like feel. The view you makes it seizable since looking from above like gods from Mount Olympus. A truly awesome image. Thanks for sharing! Your working is inspiring. Really. Keep it up! Wow! Spectacular! Awesome view and photo. Very cool view! And i like your processing of it too. todas tus fotos son estupendas, pero esta es de lujo total, felicidades!!! Abrumador punto de vista de esa sensacional vista. Muy buena foto. wow awesome vantage point. I assume it was a helicopter ride. How much did it cost? La foto es impresionante y supongo que la experiencia también. Me gusta especialmente el colorido de la imagen. Muy buen trabajo. wow what a beauty!! amazingly beautiful. Wow! So mesmerizing and beautiful. What an incredible capture. I see a guy in a barrel trying to do the falls..lol..really nice....different perspective. I was just browsing, though this photo grabbed the attention all at once, really very good and impressive angle and good use of color to depict the depth of water. What an incredible place you have shot here! It's just amazing what nature forms! Never seen them from up here! Amazing shot and post processing! Just gotta love it! I am going to Greenland on friday and gonna fly with a helicopter for the first time! It´s not gonna be over the Niagara falls, but I can not wait. La perspectiva y los colores son Fantásticos. Tolle Aufnahme !! Impressive shot. Love the vibrant colors. Must have been a great experience. Frequently floating around are the amateur, and sometimes professional flat-level view of the American falls lit up at night. Boring. seen it a million times. Wow, it's a fantastic view. Colors are great too.